Rayport and Sviokla (1995) introduced the term electronic marketspace and suggest it is a new environment which has implications for the way in which businesses trade. The speed of development of computer, network and Internet technologies has played a key role in the rapid expansion of the marketspace and subsequently the commercial practice of electronic trading. It should be remembered, however, that electronic trading per se is not a new phenomenon; commercial exchanges have taken place using electronic data interchange (EDI) and dedicated data links between organisations for several decades. Nevertheless, what is new is Internet technologies. Communication standards and protocols create a virtual trading environment where any organisation with a computer and access to the Internet has the potential to trade in global markets. It is the aim of this section to focus on this potential and investigate growth, volume and dispersion of B2B electronic markets (the technologies and management activities taking place have been discussed in earlier chapters). 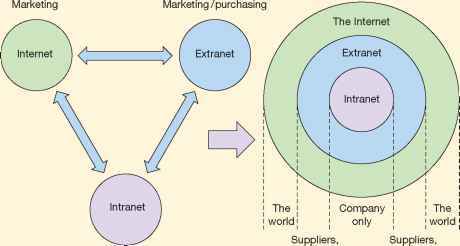 Traditionally, there are three main types of organisational markets in which businesses primarily trade with businesses. In the UK, the economic activities a company engages in allow it to be classified using Standard Industry Codes (SIC) that facilitate statistical analysis (at a government level) and common activity structures (for non-governmental administrational purposes). SICs were first introduced in 1948 but are regularly updated to reflect changes over time and to accommodate new products and new industries. SIC UK are integrated into European and international coding to ensure consistency in classification of organisations by activity (Central Statistical Office, 1992): for example, computer and related activities have a primary code number 72 and secondary codes for hardware (721), software (722) and data processing (723). Companies in such markets are heavily dependent on raw materials and actually producing tangible goods. SIC industrial markets include: Agriculture and hunting and forestry, Fishing, Manufacturing (fuel processing and production, chemicals and man-made fibre, metal goods, engineering and vehicles industry, printing and other manufacturing), Electricity and gas supply, and Construction. The nature of these types of industrial markets is such that some of the manufacturing sectors are dominated by a small number of very large companies. This is particularly noticeable in areas of manufacturing that require major capital funding and investment (e.g. ship building and the manufacture of chemicals). In the case of extraction industries, geography impacts on the dispersion of companies, physically bringing companies together in specific regions based on availability of and access to required raw materials. It should be noted that this does not mean all manufacturers operate on a vast scale. In the case of specialist engineering companies, they can be quite numerous, small in size and widely dispersed. Organisations in these markets buy products and services in order to resell them. Under the SIC systems these types of organisations include those engaged in: Wholesale and retail trade, Repair of motor vehicles, Motor cycles, Household and personal goods, Hotels and restaurants, Transport, storage and communications, Financial institutions, Estate agents and letting. This covers a very diverse collection of organisations and as a result company size and market-sector structures vary considerably. These markets consist of government agencies and bodies that buy goods and services that are required to carry out specific functions and provide particular services. Governments control vast funds of public money generated from direct and indirect taxation. In many instances, purchasing requirements exceed those of large private commercial organisations. Under the SIC system the types of organisations include: Public administration, Education, Health services, Armed forces, and Other community, social and personal services activities. In the first instance, questions about growth and the rise of electronic networks and the information revolution primarily focused on reseller markets (B2C Internet marketing is discussed in detail in Chapter 10) and questioned whether the online trading environment was 'merely another revolution in retailing formats' (Evans and Wurster, 2000). However, as commercial adoption of the Internet expanded it emerged that information was at the heart of value creation and competitive advantage. Evans and Wurster (2000) suggested the reason for this is that the majority of traditional principles of business strategy continued to apply in electronic markets but the objects of strategy such as business units, industrial supply chains, customer relationships, organisational structure, etc., were held together by a glue and this glue is information. They continued, stating that this glue gets dissolved by new technologies and as a result formalised and well-established business structures and supply chains are changed and begin to fragment. It soon became apparent that the online trading environment was much more than an innovative retail format and that all types of organisations would be affected to some extent by the new technologies. A recent benchmarking study by the DTI (2004) found that in the UK approximately 90% of businesses have access to the Internet (in companies with over 50 employees the percentage is approaching 100%). The report concluded that the key measure of ITC adoption is no longer about connectivity and access to the Internet, but rather the degree to which technology is being used to deliver real value for businesses. Many UK organisations are focusing on how to reduce operating costs and develop more integrated supply-side systems both internally and with partners. See Case Study 11 for further discussion of growth, volume and dispersion within electronic markets.